Apple’s 10th anniversary iPhone 8, rumored to be called iPhone X, is now expected to come with a MacBook Pro-like Touchbar called function area, reports claimed. According to reports from KGI Securities’ Ming Chi-Kuo and iDrop news, Apple is indeed reducing the bezels on the iPhone 8 just like Samsung Galaxy S8. Pictures released by iDrop shows that the home button with TouchID is also not present in the front. Instead, there is a MacBook Pro-like Touchbar called function area which will keep changing as apps usage. This means that if the iPhone 8 comes at a size of 5.8-inches (as speculated), then the usable display real estate will be around 5.15-inches thanks to the function area. The function area is expected to offer features such as dynamic buttons, similar to that of the Touch Bar on the MacBook Pro. For instance, the function area could show media controls, accept/decline buttons for calls, sharing options in Safari, and much more. The renders released by iDrop also shows things such as editing tools in the Photos app being moved to the function area. Interestingly, the Touch ID may be placed in the function area. More than anything, these renders show how well the nearly bezel-less design lends itself to the implementation of a function area. Several reports have earlier tried to hint what the next iPhone 8 will look like. 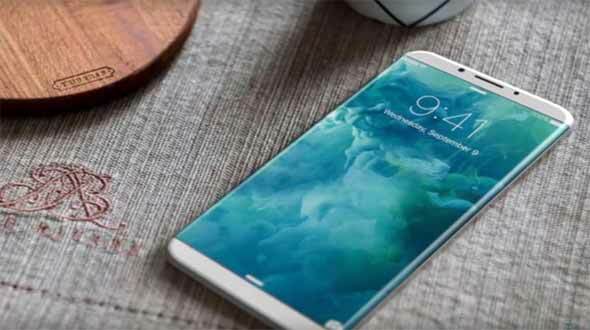 Speaking if the iPhone 8’s display, 2017 will mark the first-year Apple will shift from an LCD panel to an OLED panel in the iPhone. Like Samsung’s class-leading Galaxy phones, Apple’s iPhone 8 will feature an OLED panel. Also like Samsung’s recent Galaxy phones, the iPhone 8 display is expected to be a flexible panel that curves on either side at the edges. As we noted above, however, we expect the curve to be much subtler — just a slight downward bend for styling. Apart from the processor, the iPhone 8 is also expected to feature a better display, a next-generation Touch ID fingerprint scanner, faster NAND flash memory, an improved Taptic Engine for even more precise haptic feedback, and upgraded cameras. Last but not least, Apple is finally expected to adopt wireless charging in the iPhone 8. Rumors have been swirling for more than a year that Apple may be working with Energous to add long-range wireless charging to the iPhone. The technology would allow an iPhone to be charged wirelessly by a special base station from across a room, at distances of up to 15 feet. While the two companies may or may not be working together and, according to a new in-depth analysis, they are not working together at all it seems unlikely that Energous’ technology would be ready in time for a September iPhone launch.